Flexible power plants powered by medium speed generators (300-1200 rpm) are capable of adapting to dynamic changing conditions. These generally include balancing supply and demand by the hour and minute, or deployment of new generation and transmission resources over a period of years. Flexible power plants mainly address the challenges of fluctuations and uncertainty in fuel prices, rapid deployment of variable generation plants, adoption of new technologies at the consumer level, and changes in system standards and policies. Flexible power plants powered by medium speed generators (300 rpm to 1200 rpm) are gaining momentum as a part of the decreasing reliance on power generation from coal. Flexible power plants running on dual fuel and renewable engines are also gaining popularity. This is one of the ways of ensuring future investment stability and sustainability in electricity generation. Various capacity market auctions have been introduced where generators can earn additional revenue in return for providing capacity at times of system stress. 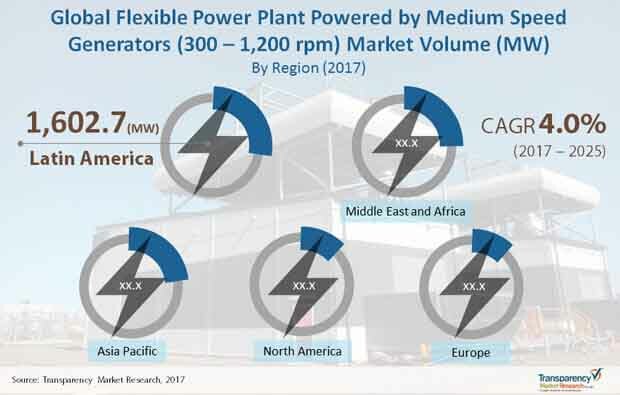 The global flexible power plant powered by medium speed generators market held a total volume of 5,779.6 MW in 2016 and is likely to rise to a volume of 7,901.5 by 2025 at a solid 4% CAGR. The global flexible power plant market is segmented into heavy diesel and other fuels by fuel type, with the other fuels segment made up by LNG, light diesel oil, renewable energy, and dual fuel setups. Other fuel types accounted for a major share in the global flexible power plant powered by medium speed generators (300-1200 rpm) market owing to the increasing environmental regulations regarding emissions. In terms of volume, other fuel types accounted for about 79% of the global flexible power plant powered by medium speed generators (300-1200 rpm) market in 2016. The others sub-segment held the largest share in the other fuels segment of the global flexible power plant powered by medium speed generators (300-1200 rpm) market in 2016. The market share of the other fuel types segment is anticipated to grow at a considerable rate during the forecast period owing to them being more environment-friendly in comparison to heavy diesel oil. The 101 MW to 500 MW segment held a significant share in the global flexible power plant powered by medium speed generators (300-1200 rpm) market by plant size in 2016. The segment is predicted to maintain its control over the market during the forecast period owing to the high number of upcoming flexible power plants of this plant size. By application type, IPPs accounted for a substantial share of the global flexible power plant powered by medium speed generators (300-1200 rpm) market because of the rising power requirements from off-grid customers. IPPs are likely to lead the market during the forecast period, followed by government utilities in terms of share and growth. By generator rating capacity, the 3MW – 5MW segment held the primary share in the global flexible power plant powered by medium speed generators (300-1200 rpm) market. This segment was followed by the above 10 MW segment in terms of market share. The 5MW – 10MW segment is expected to grow at a significant rate during the forecast period and is expected to be followed by the 3MW – 5MW and 2MW – 3MW segments. Asia Pacific held a dominant share in the global flexible power plant powered by medium speed generators (300-1200 rpm) market in 2016 owing to rising demand for continuous and stable power in the region. Asia Pacific was followed by the Middle East and Africa in terms of market share for flexible power plants powered by medium speed generators (300-1200 rpm) in 2016. The Asia Pacific market was valued at 1347.9 MW in 2016 and is projected to grow at a substantial rate of 3.5% during the forecast period. Key players in the flexible power plant powered by medium speed generators (300-1200 rpm) market include Wartsila Corporation, MAN Diesel & Turbo, Caterpillar, Cummins, Daihatsu Diesel Mfg. Co. Ltd., Kohler Co., GE Power, Rolls Royce, Doosan Engine, Kirloskar Oil Engines Ltd., Yanmar Co., Ltd., and Contour Global. Flexible Power Plants Powered by Medium Speed Generators (300-1200 rpm) have the ability to balance demand and supply in power generation for a period of number of years. It can even deploy new generation and transmission resources. These power plants have the ability to adapt to changing conditions. Population has been increasing exponentially across the globe which has led to rise in industrial and commercial activities. The developing regions especially in Asia Pacific, Middle East and Africa and Latin America have a huge demand for power for their countries to be energy secure and sustain for the future growth. Thus, the demand for power (in the form of electricity) has been rising constantly owing to the rapid industrialization and urbanization. However, production of electricity has not kept pace with the rise in demand for power across the globe. This offers opportunities for flexible power plants to bridge the gap between power generation and consumption. Many residential users install generators due to the lack of utility-scale power or inconsistent power supply. Commercial and industrial users install generator sets to ensure steady power supply in case of inconsistent or lack of on-grid power supply. Thus, increase in demand for power across the globe has boosted the sales of generator sets employed in flexible power plants running on diesel fuel, renewables, and natural gas. These generator sets are capable of running on dual fuels for peak and base power generation. Secondary research sources which were typically referred to include but are not limited to: company websites, annual reports, financial reports, internal and external proprietary databases as well as relevant patent and regulatory database, national government documents, statistical databases, market reports, news articles, press releases, industry magazines, webcasts specific to companies operating in the market, and regulatory databases such as ICIS, Hoover’s, Factiva and Bloomberg, national government documents, statistical databases, and webcasts specific to companies operating in the Flexible Power Plants Powered by Medium Speed Generators (300-1200 rpm) market. We conduct primary interviews on an ongoing basis with industry participants and commentators to validate data and analysis. Primary and secondary research were conducted to understand and arrive at trends, which were employed to carry out forecasts for the Flexible Power Plants Powered by Medium Speed Generators (300-1200 rpm) market. These help validate and strengthen secondary research findings. These also help develop the analysis, team’s expertise and market understanding.